Stacked-NYC: 10 Cheers for Librarians! over the New York Public Library in Manhattan. Chosen from over 1700 recommendations, the winners ranged from high school and community college librarians to specialists in business skills and learning disabilities. Each of the gracious acceptance speeches acknowledged the essential support of colleagues and family. Guest speaker Caroline Kennedy praised the contribution of librarians to the public school reading programs she actively supports while Vartan Gregorian, the affable and scholarly former NY Public Library president and now head of the Carnegie Corporation of New York, quoted Andrew Carnegie's reference to libraries as "bridges to the past" and "instruments of civilization". 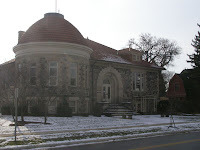 The Carnegie library in Clyde, Ohio. As a reminder of Carnegie's benefactions, photos of many of the original libraries he funded were shown on a giant screen, including several in New York, New Jersey and Connecticut as well as Ohio, South Carolina and California. In these tenuous times for public funding, it was heartening to learn that 77 million Americans now own a card offering all the transforming gifts of a public library.